I wanted to wish all of you a Happy New Year. I don't have a New Years card to share, but I do have this fun and bright little number I made over the weekend. I've had my eye on this die for awhile now. I added it to my Christmas wish list and was so happy to get it. In the picture it looks like I stamped a row of dots, but I didn't. I wish I would have mounted the card front with foam tape. I think that would have made a big difference. And these flowers..in love and so fun to work with. Wow...this is so pretty! I love those colors, so bright and sure to bring a smile to the face of who ever receives it. Happy New Year! Awesome, Deanna! You have NOT lost your touch...Happy New Year friend! Love this card Deanna. So pretty. Happy New Year to you. Happy New Year Deanna! 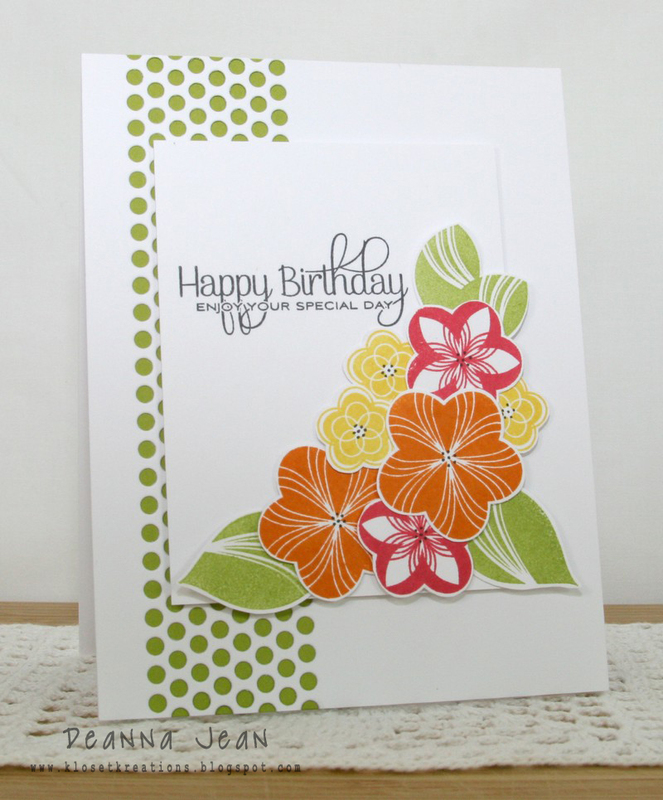 You always make the freshest flower cards and this one is no exception. Very pretty! I love these beautiful tropical colors!!! Loving your choices of colors and design! Makes me smile :) Have a blessed day!